Tonight is a Blue Moon. The Blue Moon occurs when there are 2 Full Moons within the same month. 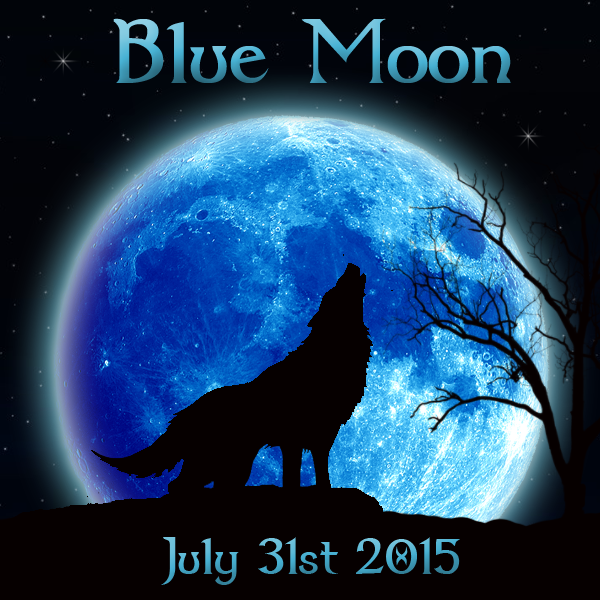 The name Blue Moon comes from an ancient word which is “Belewe Moon”, meaning Betrayer Moon. Monthly Moon phases were each given names to prepare for various types of weather and crop rotations, so the extra Full Moon in a month would confuse people, thus giving it the name Betrayer Moon.Tonight’s Full Moon is rising in the constellation of Aquarius. There is so much happening around this Moon in terms of once-in-a-lifetime type chances. It’s as if we are all on the edge of something so big and we have to make the decision to take the path we’ve always taken, or jump into the territory of new possibilities. This Full Moon in Aquarius is about celebrating our individuality, our little quirks that make us different from everybody else. Let your creativity come out. Do something a little different, dress a little differently, wear your hair a little differently, rebel against the norm. Take a walk on the weird side of life. Our minds will be clear and uncluttered, we will be able to see things as they really are, we can take off our rose-colored glasses and take a good look at ourselves and the world around us as it is, not how we want it to be. This will also have us asking ourselves if we are happy with where we are and what we’re doing. As amazing as this Moon will be, and necessary, it’s going to be one that challenges us on every single level. In the build up to this lunar event we may have been feeling restless, or have had an excess of nervous energy. Our pulses may have been racing, and it may have been harder for us to relax or fall asleep at night. Our spirits can sense that we are on the verge of something big, but it’s up to us to initiate change. We are on the threshold of having massive pieces of the puzzle collide. There may be big changes or upsets in the status quo during the next several weeks. We may find ourselves acting in ways that only a few weeks ago, we never thought possible, but Aquarius is lighting a fire inside of our hearts and daring us to break the boundaries that have held us back for far too long. While we may feel anxious at all of the possible changes being presented to ourselves, know that the universe won’t bring us anything we aren’t ready for. The truth of it is there is no such thing as the perfect time, so now is as good a time as any. Everything that we have been going through the past year has been leading up to this Moon. It’s the time of infinite possibilities, of desires bubbling over and manifesting themselves in our lives in ways we never thought possible. No matter what has come in or out of our lives in the past few years, once in a while we are given the chance to have everything we’ve always wanted, we just have to make the choice now to not let it go. Because certain chances only come around once in a Blue Moon. Written & photo credit goes to Wicca Teachings.